As an introduction for those not familiar with Patria, the following descriptions of the individual works are intended to give the reader an overview. Eventually, by following the indicated links, threads that lead to related aspects of each topic may be followed at will. Much of this text (shown in italics) is taken directly from Schafer's excellent book Patria and the Theatre of Confluence. (Published by Arcana Editions, Indian River, Ontario, Canada K0L 2B0) A revised version, Patria: The Complete Cycle was recently published by Coach house Books. "Without man the world was born and without him it will end"
The setting is a small, remote lake just before dawn. Singers and musicians have been positioned around the lake's perimeter. 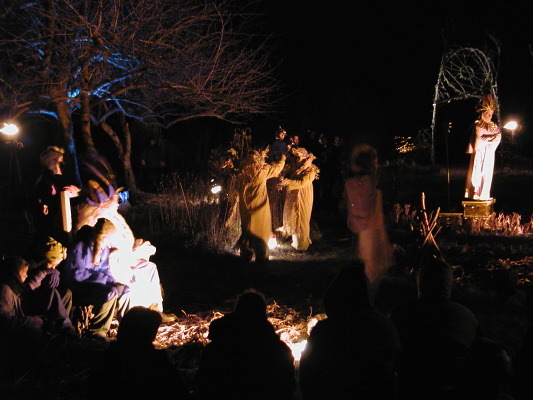 The audience arrives in darkness and is led to a cleared space at the water's edge. A haunting aria floats across the water as a dim light is seen approaching from the far side of the lake. Mingling with the sounds of awakening birds and other wildlife, and the murmuring of the forest, we hear a chant and as the light draws nearer we begin to discern a figure, in a canoe, dressed as a creature of the woods. This is the Presenter, who is our interpreter. He relates a legend of the Princess of the Stars who, listening from the heavens, hears the cry of Wolf and falls to Earth. How Wolf, frightened, wounds her. How she is captured by the 3-Horned Enemy and taken to the bottom of the lake. With the help of the Dawn Birds, Wolf begins his search for the Princess, a search that will take the two through many lives and places. The Wolf, the Three-Horned Enemy and the Sun are represented by giant puppet structures built onto large canoes. The Dawn Birds are winged dancers, also in canoes. The Princess of the Stars was originally presented on a small lake outside Toronto in 1981 by New Music Concerts, then remounted in 1985 for the Banff School of Fine Arts summer festival on a remote lake in Banff National Park. Over 5000 people made the pre-dawn trek to see the Banff spectacle during the three mornings it was presented. Patria Music/Theatre Projects (the organization that is set up to produce the Patria works) remounted Princess of the Stars in September,1997 in the Haliburton Forest and Wildlife Reserve. "Right from the beginning it was weird"
The character of Wolf appears now as an alienated immigrant (D.P.) arriving in a new country understanding neither the language nor the social customs. The story unfolds in a series of tragic/comic episodes as D.P., unable to adapt, disintegrates to the point of mental collapse and suicide. The characters and situations are absurd and unsettling, reflecting the protagonist's feelings of alienation. This work and the companion piece, Patria 2: Requiems for the Party Girl, were presented in relatively conventional environments and circumstances which somehow gave rise to situations that were absurd and unsettling for us. Co-Produced in 1987 by the Canadian Opera Company and The Shaw Festival. "Ariadne...from time to time we practice witchcraft"
The companion piece to Wolfman, Requiems for the Party Girl chronicles the journey of the Princess of the Stars in her earthly form of Ariadne through a modern world of alienation and madness. In this chapter, Ariadne is presented as a mental patient intent on suicide, with her sense of alienation being reinforced by a pre-recorded tape comprised of the lines of the text echoed in a variety of languages. The orchestra is part of the action and as such were costumed as the inmates of the asylum. "In Patria 2, we encounter the aberrational time of dreams or of the mental patient's mind; at times it stands still like dough in a bowl; at other times everything erupts and history is made in milliseconds. I wanted to create a work like a dream, no up or down, before or after, beginning or end, but only flow, musical flow, the flow of noises, of voices, near, distant, unintelligible." Originally produced by Stratford Festival, Ontario in 1972. Remounted by Autumn Leaf Performance at the DuMaurier Theatre Centre in Toronto in 1993. The Greatest Show provides a vehicle whereby the elements in Patria 1 & 2 are broken apart, pulverized, ready to be reconstructed in the next work, Patria 4. The setting for this deconstruction is a small town fair or carnival with one hundred acts. The Hero (Wolfie, D.P., Kafka) and Heroine (Ariadne) are brought on to the main stage, the Odditorium, at the beginning whereupon the Black and White Magicians make the Hero disappear and cut the Heroine into pieces. For the balance of the performance the audience is free to wander the grounds at will, much like at a traditional fair. There are games and hucksters, strolling entertainers and booths of all sorts. There are tents with displays and three large tent theatres with small performances, tickets to which may only be obtained by winning a game or providing the correct answer to a question. The audience becomes aware that everything they encounter points to the eventual reunion of the Hero and Heroine. 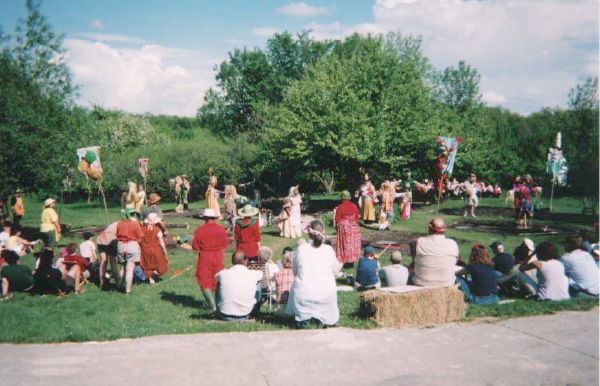 Presented as a workshop production in 1987 and as a full production the following year by Patria Music/Theatre Projects and the Peterborough Festival of the Arts, in Peterborough, Ontario. The subject of this work is the Chymical marriage of the elements and the resulting creation of The Divine Child. The writings of the medieval alchemists provide a framework for a journey that has more to do with the attainment of spiritual perfection than the practical matters of science. Originally conceived for production in an abandoned mine, the search for suitable sites was a journey in itself. The initial production was performed in an abandoned winter circus building in the heart of Liège, Belgium - appropriately enough an ancient mining city. A subsequent production, this time entitled The Alchemical Theatre of Hermes Trismegistos was mounted in Toronto, Canada in the cavernous Main Hall of Union Station, after the last train. All performances began at midnight. First produced by the Festival de Liège, Belgium in 1989 and remounted in 1992 by Autumn Leaf performance. "There comes a time when everything must be told simply"
Intended for production on an ocean beach, this piece takes us to ancient Crete and the Palace of Minos. The setting would include a glittering metal palace incorporating an instrumentarium or giant sound sculpture. There would be a large open space for dance, as the piece is conceived as a dance/drama. And of course a labyrinth. It is the tale of Theseus and Ariadne, the labyrinth and the Minotaur, peopled with masked archetypes and set in a richly symbolic environment. "The dancing floor could be raked up to the palace so that the open spaces of various depths and configurations beneath would also serve as resonators for the dancers' footsteps, or at any rate for objects forcefully struck on the surface, each area resonating differently according to the depth and size of the cavity beneath it... ...I have given the male chorus poles to strike on the floor with the intention of utilizing this feature, and various dancers could also have poles, for instance in the Dance of the Double Axe. For this idea to be truly effective the labyrinth would have to be constructed along 'musical' lines. Each chamber or tunnel would have its distinct Eigenton and the various zones of the stage above could be played almost like a giant marimba." The only production to date has been a concert version with orchestra, chorus, actors and projected slides of conceptual drawings. 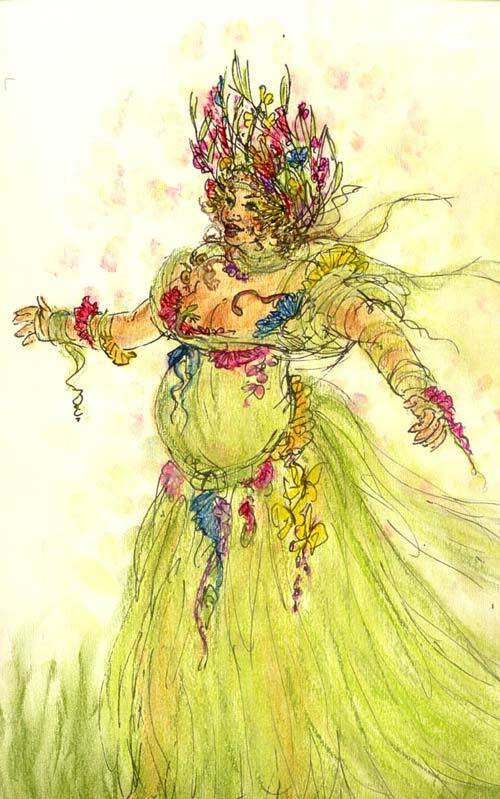 [Left: Elder with voice-altering mask and sound sculpture costume - Concept sketch by Diana Smith. Following the journey of the sun god of ancient Egypt from his death in the evening, through the underworld of night to be reborn in the morning, this all-night opera/theatre experience takes place in real time. The audience members become initiate priests of the god RA, to the extent that each one is given a robe, headdress and an amulet with one of the seventy-five names of the sun god. 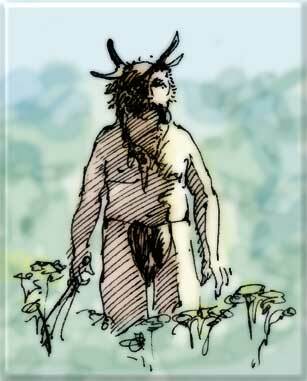 They are taught to recognize scents associated with the various gods they will encounter. They learn chants to help overcome the great serpent Apophis. The journey of RA is their journey and they too are reborn with the dawn. "Finding venues for Patria works is never easy and finding a site for RA was especially difficult, since the action was to be itinerant and called for twenty-five to thirty locales, both indoors and outdoors"
In taking a work out of the controlled environment of an equipped theatre, we always have to make compromises. The site must transform to meet the demands of the work and the work itself often goes through an adjustment to take advantage of the opportunities presented by the physical attributes of the site. RA more than any of the Patria works has been shaped by the nature of the locations in which it was performed. Each time we are fortunate enough to be able to mount a Patria spectacle, we get a little closer to achieving an ideal marriage of site and concept, one which can produce a profound transformation in both the audience and in the creative artists. Produced by Comus Music Theatre in and around The Ontario Science Centre, Toronto, Canada in 1983 and in various locations in Leiden, Holland as part of the Holland Festival in 1985. The setting is the great T'ang dynasty of China (A.D. 618--907). 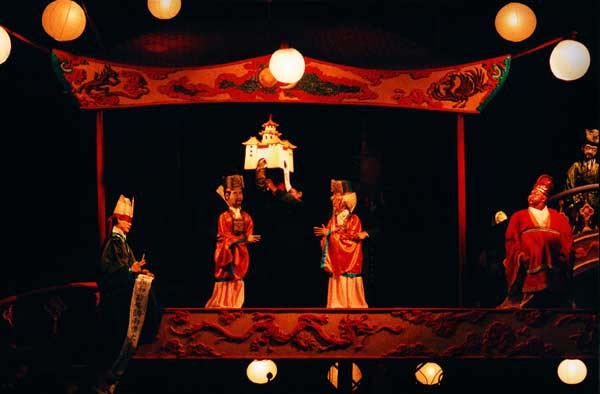 While the presentation makes many historical references and includes many authentic Chinese elements, the story and the treatment are original. This site will be expanded as resources allow. We wish to thank the Ontario Arts Council and the Canada Council for their generous support. We would appreciate any comments and will reply to your email.